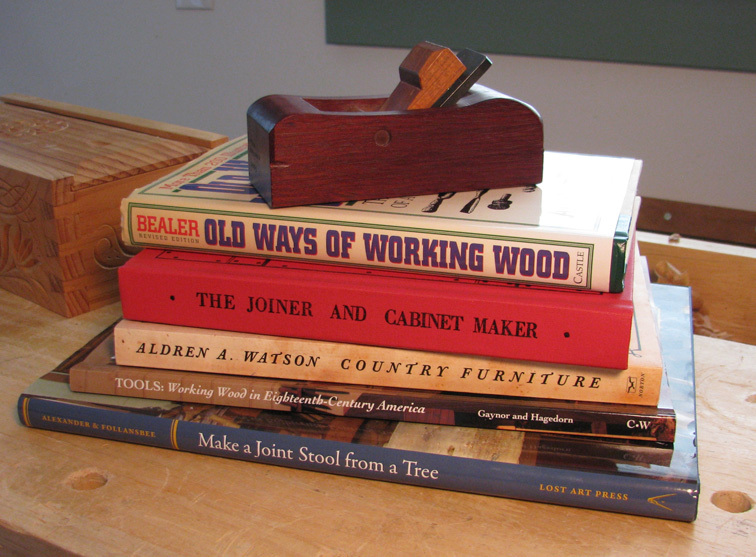 I've spent the last four months building my workbench and getting ready for a presentation that I gave yesterday for the York County Heritage Trust on 18th-century woodworking tools and joinery. 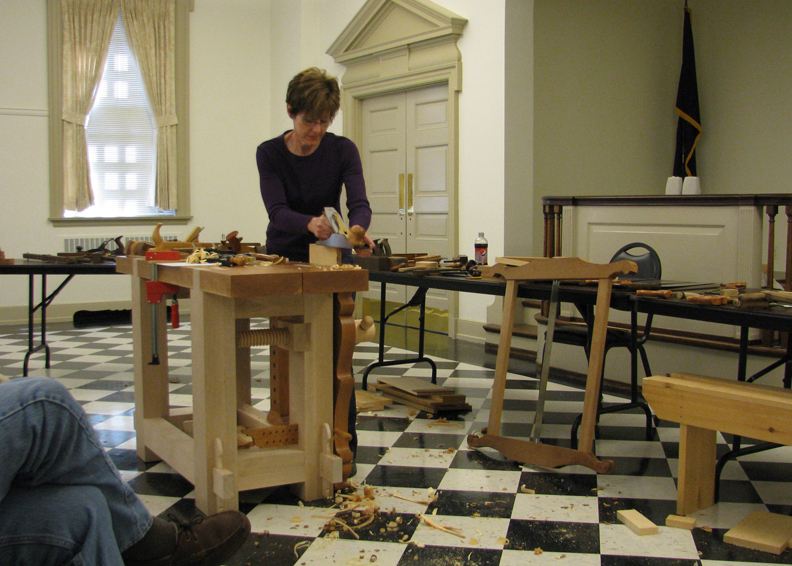 In preparation, I read five books (for the first or second time), studied page after page on the Colonial Williamsburg website and many other sites, and watched the Colonial Williamsburg DVD on cabinetmaking. I took tons of notes, whittled them down to the most interesting bits, and wrote and refined an outline until it was skeletal. I practiced my lines, sharpened all my tools, made various joints, and tried not to panic. And the presentation went surprisingly well. Did I forget to mention some things? Yep. Was I nervous? Only in the beginning. Did I mess up? You bet. I referred to my plow plane as a grooving plane, and wish I had set some of my planes to take thicker shavings. All of mine, except for the scrub, were set to shave whispers of wood which isn't very impressive to the guys in the back row. There were 75-80 people in attendance. And for an hour and 20 minutes, everyone seemed genuinely engaged. What I took away from all this is that working with hand tools is extremely interesting to many folks—both woodworkers and non-woodworkers—and it's our responsibility, even if it's outside our comfort zone, to be open to opportunities to share what we know. center and a well-sharpened antique saw. It was exciting to see a few young people in the audience. One 14-year-old boy stuck around for quite awhile afterwards to listen to the other woodworkers in attendance talk about the craft. 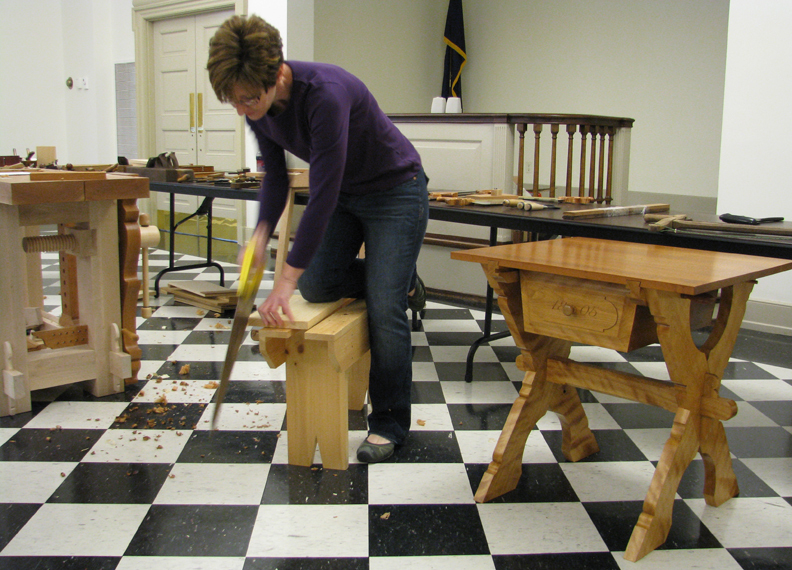 What I hope people took away with them was how easy, fast, and fun it is to use these tools, how the tools are simple yet refined (not crude implements), and how closely connected we are to early woodworkers. There was one other book I read a few months ago: Kruschev's Shoe, by Roy Underhill—a fascinating book that offers ways to captivate an audience and become an engaging speaker. It was enormously helpful. One powerful phrase that stuck with me was the very last line in the book: Taking your turn to lead is part of becoming fully human, as beneath your feet you feel the planet tilting in its path, shifted just a bit in its course by your courage and skill. Thanks for the shot of confidence, Roy.